Simple and innovative solutions in the area of information and communication are in the company's focus since its foundation. Today, the software PowerPoint Scheduler is successfully used wide in smaller and larger organizations as well in different industries. In entrance halls or at exhibitions, to name just two applications, Microsoft PowerPoint® presentations that run continuously are often shown to the visitors. 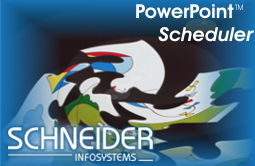 Only PowerPoint-Scheduler allows showing different presentations by using a predetermined time schedule. Thereby PowerPoint-Scheduler switches presentations, videos or Internet Television right on time. Concurrent to the running show music or Internet Radio can be played too. By use of overlaying ticker messages the visitors can be informed quickly and easily about breaking news without changing the current presentation. PowerPoint-Scheduler, the time-triggered communication solution, addresses easily and efficiently your audience always on time. 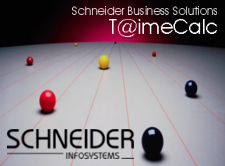 Among the series Schneider Business Solutions the company Schneider Infosystems Ltd. offers different PC applications as Shareware. Originally, the software products were developed to facilitate working processes and increase efficiency within the own company. Meanwhile the innovative programs are very popular in several small and medium companies around the whole world. All programs are available on the platforms Microsoft Windows Windows7/Vista/XP. Manage working hours of your personnel and your current cost units (orders, projects). Plan working hours in advance and analyze the journal entries by cost unit and personnel over a selectable time period. Each collaborator schedules the time spent on the different projects. T@imeCalc offers many analysis functions and creates different reports for internal and external use. With the optional module "Expenses" you are able to manage the expenses for each project and person individually. From two licenses, the software is networking capability.